While this may often distinguish genuine DVDP (= movie credits) data from IMDb data, it doesn't always work that way - there ARE movies out there with credits like that. Quite recently I came across one (can't remember the title now). Users should be aware of this. Sure, it would be just a starting point for finding profiles that might need credit checking. For a quick fix to Discostu's request, see here. I solved that problem. In fact, I have to run DvdProfiler as an administrtator to see the plugin work correctly. Running as an administrator was not necessary for the main program, but it seems to be necessary for some plugins. I can verify this and it is a problem. Administrator (user) has a completely different profile and therefore you must reconfigure all settings and paths to db etc. If you mean running executable as "elevated" = user account you normally use has already admin rights, but you still have to right click and select Run as and administrator, that's not an option to me. I don't want give normal account admin rights. I've updated my plugin to version 3.0. It now works fine with version 4.0 of DVD Profiler. In v3.0 I have the same problems with the flagsets. What can I do? I've just uploaded version 3.0.2. It fixes two serious bugs and one minor bug. The first serious bug is the plugin will crash if you have empty tags (a tag with no name) assigned to a profile. The second serious bug is the whole program would hang if you have a profile which is its own parent and hover over the title to display the little popup. An unlikely scenario to be sure, but nasty if you have to kill profiler. Finally, I was calculating the height of the popup incorrectly. In some cases, this would cause parent profile information to display past the bottom of the popup. Everything ought to fit correctly now. Thanks to widescreenforever for sending me his collection so I could get all this stuff tracked down. the plugin worked great a few days ago, today I always get a System.DivideByZeroException when loading the plugin. I already deinstalled/reinstalled the plugin and DVDP, but the problem still exists. I added the full details below, maybe it can help? 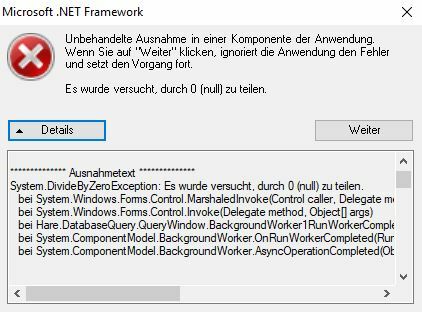 System.DivideByZeroException: Es wurde versucht, durch 0 (null) zu teilen. Win32-Version: 4.7.2633.0 built by: NET471REL1LAST_C. Win32-Version: 4.7.2556.0 built by: NET471REL1. Win32-Version: 4.7.2612.0 built by: NET471REL1LAST_B. I'll try to take a look at it this weekend. (assuming that the API uses the same terminology as in the exported XML). I think for flag sets, <ID> should be used, as it also includes the Locality. Corresponds to "Profile ID" internally. But I'm sure Mark knows that. Must have been an oversight.